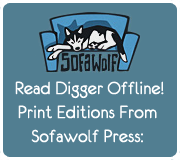 Cheap plug: Buy the first Digger book. There is a very touching story about just why Lung’s tombstone is there and what is reads. Lung’s backstory is one of my favorite parts of this whole story. Like the guy above me said, buy the book! Couldn’t you just tell us the story? 🙁 Some of us are broke. But one day you won’t be broke, and then you’ll be able to find out yourself! Patience wasn’t made a Virtue for nothing, you know. I don’t mind saying, because I think the old site’s footnote mentioned it, but Lung finds his heaven’s lack of unicorns to be a good thing. Patience isn’t a virtue. Impatience is a virtue. Think about it for a minute or so, but no more. What about hell? Do they have unicornes there? Someone uses that name on a forum, so I almost forgot it referred to something/one else. Anywho…No unicorns in heavan, eh? Even with all the virgins? I know what I want on my headstone! No Unicorns in Heaven would be a great name for a band. Noah reference? Old-style wild unicorn reference? Something completely different? I must know! Even though a good deal of the fun of Digger is going through the archives*, now that I know a Digger book or books exist(s), it is hovering around the top of my “comic compilations to buy when not broke” list. *Digger-of-unnecessarily-convoluted-tunnels. The archive numbering is (probably) unnecessarily convoluted. COINCIDENCE!? But LOTS of Marsh-unicorns: they are the nice ones when push comes to shove, not the evil-minded showy ones!